I think I read, or skimmed, this book when I was 12 or something. 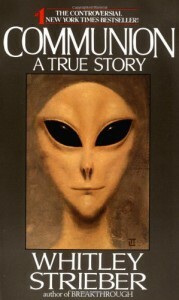 The Christopher Walken movie based on this book was hilarious (And helped me get over my irrational fear of Roswellian Grey Aliens.) I'm gonna give this one a go next time I see it in the Salvation Army where they have about 5 copies or so.